In 2007 the University of Oregon received approval from the state legislature to begin a new BFA program in Product Design. The school had also signed a lease on a new space in Portland, Oregon’s historic Old Town to be renovated into studios and classrooms. I was hired by the Dean of the School of Architecture and Allied Arts to develop a program that included identity, publicity, recruitment and curriculum development for the new Product Design BFA program. 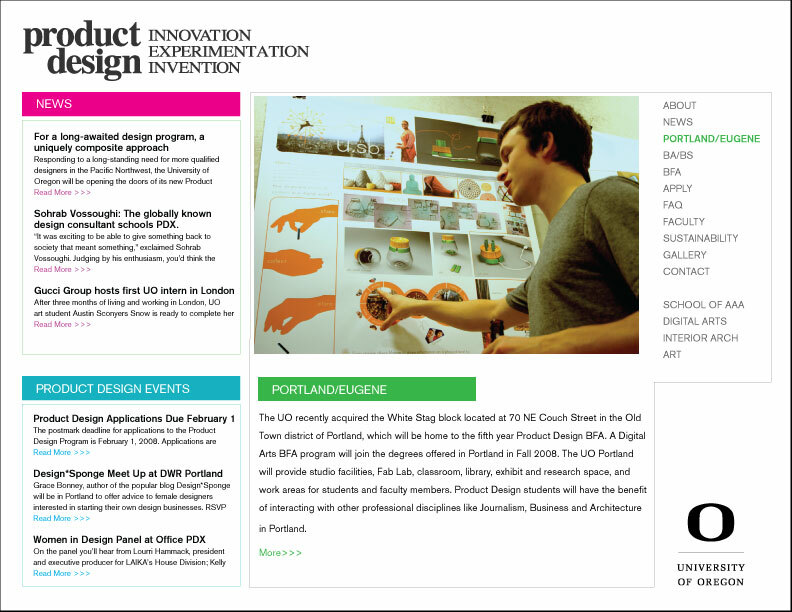 To understand how to position the University of Oregon’s new program in relation to other Product and Industrial Design programs around the country, I conducted in-depth research into existing programs both nationally and internationally. I then looked closely at the university’s long history in fine art and architecture to understand the core values that could become the key offerings in a new program in Product Design. Independent project reporting to Dean of the School of Architecture and Allied Arts, Art and Interior Architecture Department Heads.